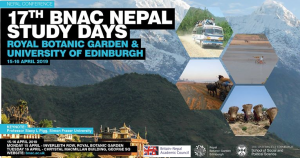 Registration is now open for the 2019 Edinburgh Nepal Study Days (Nepal Conference) 15th-16th April 2019. The conference programme will be posted here later. Registration costs £25. BNAC membership allows you free participation in all BNAC events including Nepal Study Days (saving you £25 registration fee at the NSD, but there will be a small contribution towards lunch to be paid). Annual Associate and Ordinary membership fees are £15 and 30 respectively. £3 and £6 discount is available for renewal through standing orders/direct debits for associate and ordinary members respectively. To become a member please visit http://bnac.ac.uk/membership/). To pay registration or membership fee online, please contact Dr Fraser Sugden (Treasurer) at f.sugden@bham.ac.uk . We suggest you book your accommodation in Edinburgh well in advance. The conference venue will be ‘Royal Botanical Garden Edinburgh’ (Inverleith Row, Edinburgh) and the University of Edinburgh (15a George Square, Edinburgh).